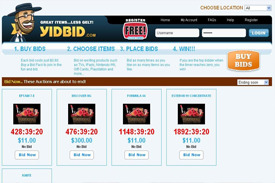 Yidbid is an ecommerce site that allows people to bid for items.It is online auction which provides you with a great diversity of high quality goods. A place where everyone is able to find what he is dreaming about!Additionally, buyers can make purchases and pay for them via credit card. Just investigate the market and choose the product which is the most appropriate for you. Online auctions are great places for entrepreneurs and bargain shoppers alike. Online auction sites are like giant flea markets; they provide a forum for buyers and sellers to find or sell just about anything. There are many ways to approach online auctions. For many, selling items on Internet auctions sites is a hobby and a good way to supplement their income. For others, it is a job and way of life. For buyers, it.s a great way to find good deals on rare, unusual collectibles or everyday items.